David Hockney recorded a film called “A Day on the Grand Canal with the Emperor of China, or Surface is Illusion, But So is Depth”; it is from 1988 and is only available now on VHS, which is really a shame (there is a post about the scroll at hardcorepainting.blogspot.com, however). I think Hockney’s comments in this interview reveal the ways we see. And they may also reveal the ways we should be thinking about creating new art. There is a small problem of dates here, of course, and we’ll take a minute to acknowledge our poetic license. Manet and the Impressionists were, for Rossetti and friends, precursors, painters to react against, and yet this painting of Manet’s was completed at a later date than Rossetti’s. But the two faces are hauntingly similar, and so I am asking for a bit of Keatsian “negative capability” here. And that’s actually rather appropriate, since Rossetti’s poetry was heavily influenced by Keats. Rossetti and the Pre-Raphaelite circle were reacting to the Impressionists (as well as anyone from Raphael, forward) because, as Rossetti apparently wrote himself in the journal “The Germ,” artists of their time needed “an entire adherence to the simplicity of nature.” The landscapes must be real, the bodies must be real. Okay. Now come back to Hockney for just a moment. What is “real”? Is it the one-inch Emperor, and his freely-painted back streets, open to any angle? Or is it the more scientific, but rather stilted, world of the second scroll, with its boundaries like a window-frame or the view-finder of a camera? Rossetti’s painting, seen “live,” is astonishingly small (12 5/8” x 10 5/8”). Still, it is compelling. Rossetti’s model here was Fanny Cornforth, who would later become his second wife. “The Kissed Mouth” seems photographically realistic; there are perfect shadows and wrinkles at the neck, stray hairs, a face trapped in a too-small space, no lush eyelashes, and no direct gaze. The woman here almost retreats into the wallpaper; the flowers in her necklace echo those on the wall. She is still. The illusion is perfect; there are several figure painters working in this mode today. 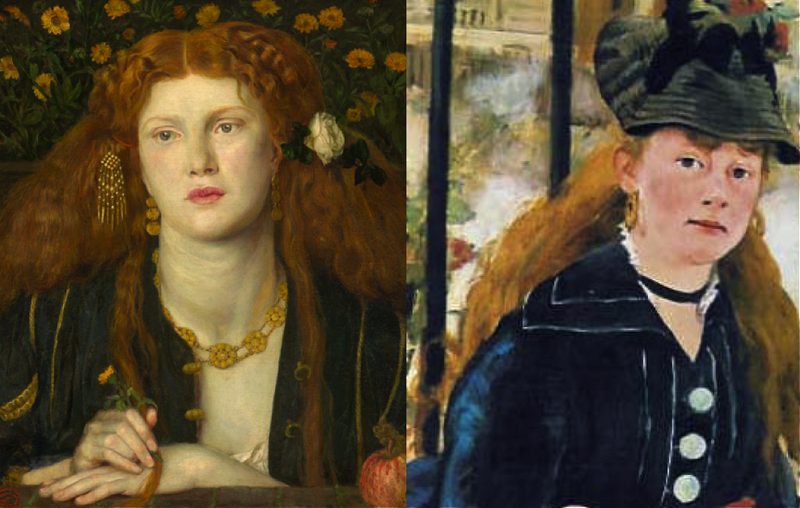 Rossetti and his group believed that Raphael, the Mannerists and the Impressionists had prescribed far too much about the ideal body, its dimensions, the spaces it must inhabit in a painting, the light, the way one pigment reacts to another … and so we are here looking at a painting which is very nearly … a photograph. She belongs, I would say, to the world of Hockney’s second scroll. The “depth” here is certainly illusion, and a good one. This woman is reflecting, we think, and we almost don’t want to bother her by looking too deeply at her. And there is a really fine interpretation of Manet’s probable intent at the blog “Every Painter Paints Himself,” dated 13 January 2011, by Simon Abrahams, where he says that “the artist’s alter ego” is “constructing the very scene we are looking at, fusing the activity in the studio with that of the scene itself.” You will need to read the full essay, I think, to see why he argues this; do read it]. 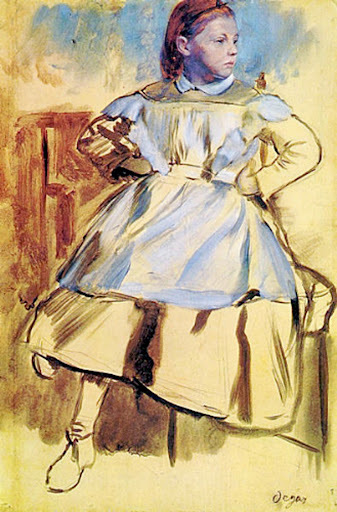 Manet’s model for the woman gazing at us was Victorine Meurent, who gazes out at us, as she does in “Le Dejeuner sur l’Herbe” and “Olympia.” But here, she is even less fully drawn-in. She is very much in the world, yet she remains mysterious; the tilt of her head suggests she may be about to move. And that uncertainty is what keeps us looking. A critic, Tim Lubbock, wrote that “Manet's magic is not to insist on finding the eternal in the contemporary. It’s just a subliminal resonance” (Friday 18 April, 2008, in The Independent, online). Lubbock wasn’t talking about Rossetti’s principles, which could be described as “finding the eternal in the contemporary,” nor was he talking about Hockney’s discussion of that first Chinese scroll. And yet … as artists, don’t we want “subliminal resonance”? the “illusion” of the “surface”? Alberto Burri's "Grande Cretto": On "Extended Wings"
"To live fully is to live with an awareness of the rumble of terror that underlies everything." I was reading a passionate review of the show "The Indiscipline of Painting," in an article called "Disciplined and Polished or Burn, Burri, Burn!" by John Bunker (read it at www.abstractcritical.com, 10 February 2012). Bunker suggests that, all too often, the way contemporary abstract artists paint and the way we write about abstraction is "too rarified, too polished, too conceptual" and he insists that painting should be about "engagement with the materiality of paint or any kind of matter without recourse to obvious mimesis." Too often, painters copy one another, copy their thoughts, copy without feeling. Bunker goes on to say that he is "interested in abstract art as an expression of human agency operating in the cracks and fissures of an image-saturated consumer society." And he points out that the works of the artist Alberto Burri (1915-1995) are the works that put "abstraction back into direct relationship with life lived." We need this, Bunker says, and I agree completely. Painting should wake the viewer up and feel entirely part of lived life. Bunker concludes by saying that Burri's retrospective [at the Estorick Collection of Modern Italian Art in London] has "the advantage of channeling the power and potential of 'dark matter.'" I had seen Burri's "Sacking and Red" and thought it in the same inventive, process-centered mode as the art of Robert Rauschenberg or Antoni Tapies. Burri was part of a movement called "Art Informel," where process, not the finished work, was the point. But it wasn't until I read John Bunker's article and began thinking about it that I realized that I had already seen Burri's most powerful work of art. It is a memorial, but one that has its own life. This was a more astonishing way to "see" the dead village than scattered ruins would have been. This is what John Bunker meant, I think, by "direct relationship to life lived." I see it as a combination of the beauty of Stevens's conclusion to "Sunday Morning" and the underlying monster in Ernest Becker's words above. I think that powerful art addresses both beauty and the "rumble of terror." 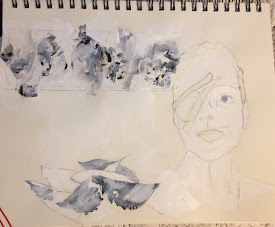 Labels: "Abstract Critical", "Grande Cretto", abstract art as process, Alberto Burri, Ernest Becker, Gibellina, John Bunker, Wallace Stevens, what is abstract art for? Elsie was his first audience, and the letters an early experiment, but later on, Bates says, Elsie turned away, because “the writing of poetry might have qualified in Elsie’s eyes as metaphysical adultery.” She felt betrayed as he began to publish; this was her husband, these were her poems. But poets need readers. Think of the stanza quoted above, where Stevens wrote “We make a dwelling in the evening air.” The poet takes the stuff of the natural world, “the same light … the evening air,” and creates an imagined “dwelling” within it through “the central mind.” The “we” must include all of us; as Bates says, “no audience, no inspiration.” In the end, Stevens’s life work would not be love poetry, but rather a philosophical exploration of seeing and being in the world. And he needed to find a way of speaking beyond the letters and he needed an audience beyond Elsie. We need to talk to ourselves every day as we confront monsters. So that got me thinking, how do painters talk to themselves? The model looks back out at Ingres, and so, at us, the audience. 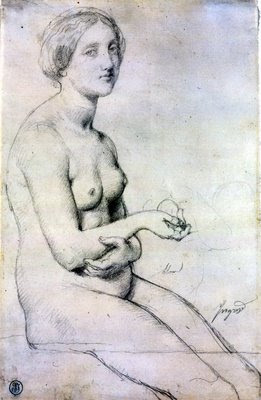 Ingres has played with light and shadow, with different types of lines, with idealizing (her perfect hands and face) and with bodily imperfection (her swayed posture, her uneven breasts). He has lavished attention on a drawing that no-one else might ever see. The drawing is complete in itself: you can almost hear the model breathe. What does this beautiful, calm figure have to do with Stevens and monsters, you ask? Outside the studio, Paris was not calm. 1830 was the year the King (Charles X, of the House of Bourbon) tightened censorship one day and dissolved parliament the next; in July came the Revolution, the Trois Glorieuses, where the newly-unemployed threw paving-stones and roof tiles and then destroyed all the streetlights. The King abdicated and Louis-Philippe (the House of Orléans) took the throne. This drawing is, I think, a way for Ingres to settle into himself, to control the chaos through creating its opposite: perfect artistic order. In this year of turmoil, Ingres might well need to talk to himself. This was painted in Florence. 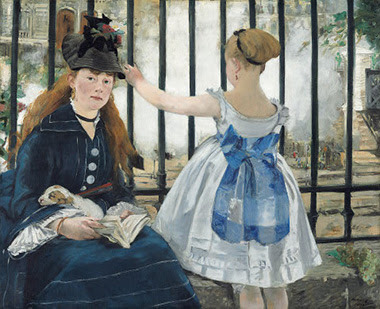 The painting is now exhibited in the Musée d’Orsay, where the website mentions its “climate of oppression” and says that even the little dog at lower right is seeking to “escape” beyond the frame. For Picasso, this was one of a series of drawings in the notebooks leading up to his “Demoiselles d’Avignon” of 1907. In the fall of 1905 and winter of 1906, Gertrude Stein had sat for her portrait, and these two nudes have some resemblance to Stein (seated, left) and Picasso’s then-lover, Fernande (standing, right), who sat with them as Picasso painted and read aloud. In Picasso and His Friends, Fernande would later write that, sometime between the Bateau-Lavoir studio and the one at the Boulevard de Clichy, she and Picasso had taken hashish with Apollinaire and Max Jacob. The poets, Fernande says, were delighted with the sensation, but Picasso, “in a state of nervous hysteria” began to shout “that he had discovered photography, that he wanted to kill himself, that he had nothing left to learn” (translated by Jane Miller, New York: Appleton-Century, p. 134). He had drawn these two women in a way that no camera could, and still he was afraid. The eye, completely anonymous …. And the idea as thing. She is half who made her…. The apparition is gone, but the poet is still free to keep speaking to himself (and, if we are lucky, to us).